Palestinian medical sources in Ramallah, in the central West Bank, reported that at least twenty Palestinians have been injured during clashes that took place with Israeli soldiers near the Ofer Israeli prison, south of the city. Thee residents were kidnapped. 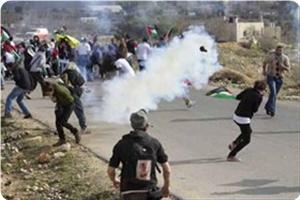 Eyewitnesses reported that the army fired dozens of rubber-coated metal bullets at the residents leading to twenty injuries, and that dozens of Palestinians have been treated for the effects of teargas inhalation. 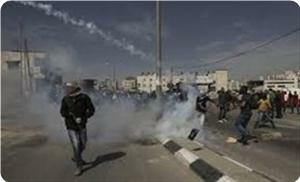 The clashes took place after the army attacked nonviolent protesters marching in solidarity with the Palestinian detainees held by Israel. Furthermore, soldiers chased dozens of protesters and kidnapped three of them, in addition to violently attacking and beating one protester leading to various cuts and bruises. Students of the Birzeit University organized the protest in solidarity with all detainees held by Israel, especially the detainees who are holding extended hunger strikes, and are currently in serious health conditions. They were also protesting the death of Arafat Jaradat, 33, from Sa’ir town, near Hebron city, who was kidnapped by the army on February 18, and was subject to extreme torture that led to his death in an Israeli interrogation facility last Saturday. Violent clashes have erupted between the Israeli occupation forces (IOF) and citizens in the villages of Fahma and Ojja, south of Jenin, during which the IOF carried out raids and incursions into homes and neighborhoods. IOF stormed the Ojja village on Thursday morning and raided houses belonging to Maali family, leading to the outbreak of violent clashes between youths and Israeli forces who started firing heavily at them, eyewitnesses confirmed. Israeli soldiers began filming the village's homes, but young men forced them to withdraw from the village, local sources revealed. Meanwhile, occupation troops carried on several military vehicles raided the house of Mohammed Jamal, 40, in the village of Fahma, south of Jenin, where they searched the house and damaged its contents, local sources stressed this morning. The sources pointed out that village's youths and students confronted the Israeli soldiers by throwing stones and empty bottles at the occupying forces, where IOF fired tear-gas grenades resulting in several suffocation cases. Israeli forces have also raided the nearby town of Arraba, where they raided and searched the house of Abdullah Nassar, the sources said, pointing out to the establishment of an Israeli checkpoint at the entrance to the village. Israeli occupation forces (IOF) stormed Al-Ras Al-Ahmar area in the northern Jordan Valley on Thursday and ordered Bedouins to evacuate their tents by next Tuesday. Ahmed Al-Assad, the head of the committee for the defense of Valley land, said in a press release that the soldiers served notifications to the Bedouins that they should be out of the area from six am to six pm next Tuesday. He said that the soldiers warned the Bedouins against remaining in their land, adding that they said that war drills would be conducted on Tobas province land. Assad noted that the temporary eviction of Bedouins had recurred recently at the pretext of military exercises, while in fact it aims at driving the Palestinian population out of the Jordan Valley. 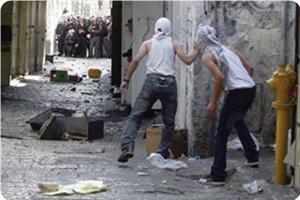 Violent clashes broke out on Wednesday between Palestinian young men and Israeli soldiers throughout the West Bank. Some of these events were due to the popular anger over the death of prisoner Arafat Jaradat under torture in an Israeli jail. The most violent of these confrontations took place at Qalandiya checkpoint between Jerusalem and Ramallah as well as in Al-Ram town northeast of Jerusalem and in Salfit town. 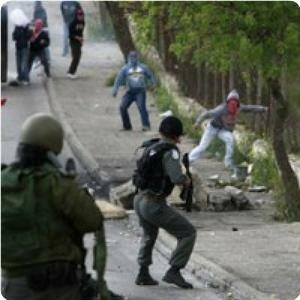 The Israeli troops used excessive violence to subdue the young protestors and chased and detained some of them. Several injuries were reported among the protestors. Al-Yamoun town west of Jenin also saw clashes after Israeli troops broke into and ransacked the house of Rizq Hamdia and questioned his family. Israeli soldiers were also deployed in Al-Widyan area in Yamoun town and at the junction of the old street, and embarked on searching vehicles. In the old city of Al-Khalil, some school students clashed with Israeli soldiers who fired tear gas grenades to suppress them. 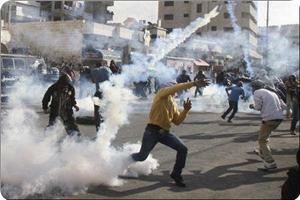 Several citizens and students suffered tear gas injuries. 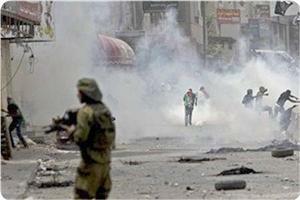 Clashes broke out this afternoon in the town of Yamoun western Jenin after the Israeli occupation forces stormed a house in the town. 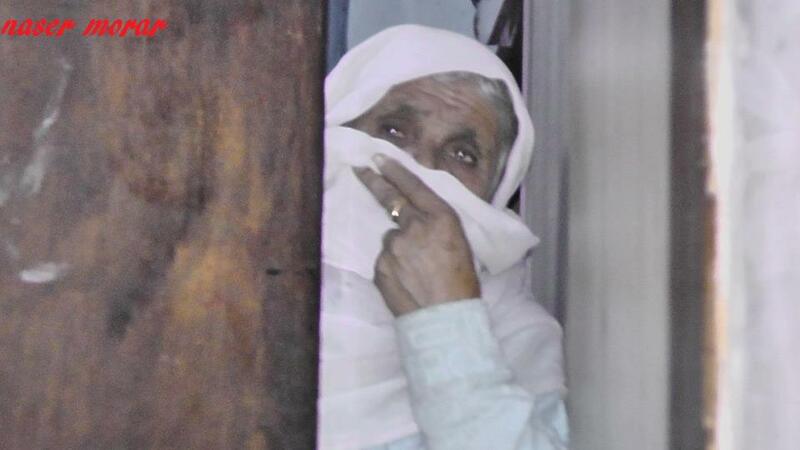 Local sources said that the occupation forces raided and searched the house of the citizen Rizk Hamdiya, 50, in the town of Yamoun then questioned its inhabitants, which led to the outbreak of confrontations. The sources pointed out that the occupation forces fired bullets and started provoking the school students and youths who responded by throwing stones and empty bottles at the soldiers. No injuries were reported. Eyewitnesses stated that the Israeli occupation soldiers were deployed in the al-Wedyan area in the town and at the crossroad in the Jenin-Haifa Street, began searching the vehicles. 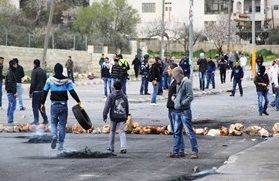 Meanwhile, local sources in the southern West Bank city of al-Khalil said that clashes broke out between the students and the occupation soldiers in the Masharqa area in the vicinity of Tariq ibn Ziyad School, near the Ibrahimi Mosque. 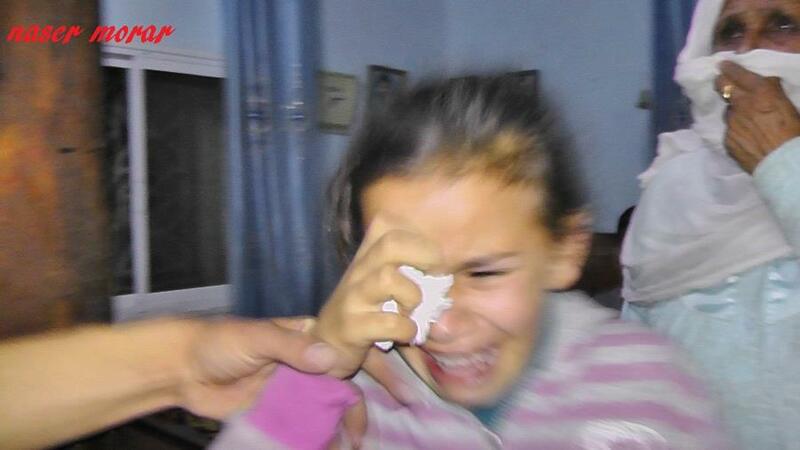 The Israeli soldiers fired poisonous gas and stun and tear gas grenades at the citizens and the school children, causing a number of them to suffocate. The wounded were treated on field by the Red Crescent paramedics. The Israeli occupation forces on February 17 forced a young Palestinian boy at gunpoint to walk among them as they were attacking Palestinian protestors outside Ofer prison in Ramallah, according to a report issued by defense for children international (DCI). Mustafa Wahdan, a nine-year old boy, told DCI that he was on his way home from his elder brother’s car wash service, about 300 meters from Ofer jail, when the clashes heated up, forcing him to take shelter in a nearby store as result of the intensity of tear gas. Some Israeli soldiers, who saw him enter the store, went to detain him and ordered him to raise his hands behind his back, exploiting him as a human shield for several hours as they were firing tear gas grenades and rubber bullets at stone-throwing protestors. "Whenever they wanted to fire tear gas or bullets at the protesters, they would take me with them. I was very scared that I could be hit with stones or anything else," Wahdan elaborated. "At home, Mustafa still feel very scared because of the experience he underwent," the father of the boy Mohamad Wahdan said. "He was silent and did not have his dinner that day. In the morning, my wife told me that Mustafa was shaking while he was asleep," the father added. The DCI stated that the use of human shields is prohibited by the international humanitarian law, and involves the forced presence of civilians to shield an area or soldiers from harm or forcing civilians to directly assist in military operations. Israeli Occupation Forces erected military checkpoints in the morning at the entrance to the town of Ya’abad and the soldiers began stopping vehicles from entering or leaving the town. 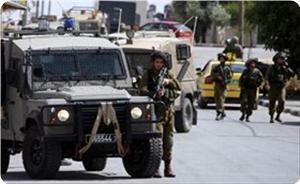 IOF searched and questioned the passengers, severely hindering the movement of citizens, local sources stated. 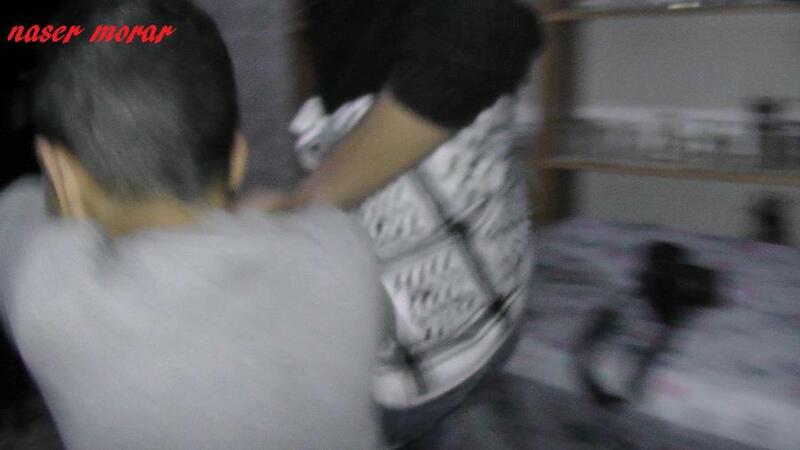 The occupation forces raided last night Ya'abad village under the pretext of searching for a minor claiming that he is required for security reasons. They stormed the house of Rashid Fares Abu Bakr searching for his child Amir, 15, under the pretext of throwing stones at soldiers. Meanwhile, IOF intensified on Wednesday its presence in the vicinity of the Jalama checkpoint along the Nazareth- Jenin road to prevent the daily clashes in the area with the occupation forces. 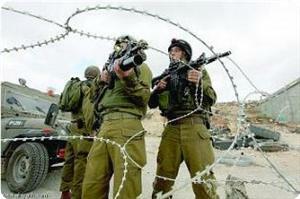 Local sources indicated that the Israeli occupation patrols stationed in the vicinity of the area, erecting checkpoints. The clashes that erupted yesterday lasted until a late hour, led to the arrest of eight boys, in addition to the wounding of several others. 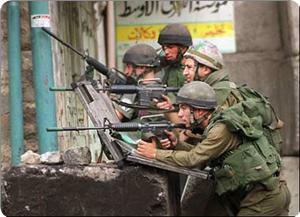 Israeli occupation forces (IOF) tried to storm Silwan intermediate school for boys in Ras Al-Amud suburb on Wednesday morning. Issam Al-Abbasi, the secretary of the school’s parents council, said in a press statement that the school administration refused to allow the soldiers, who barged into its yard in big numbers, to enter the buildings. He said that 1000 students study in the school in the seventh to the ninth grade. He urged human rights groups to intervene and prevent the repeated storming of schools at the hands of those forces. Abbasi said that undercover agents and soldiers routinely attack students while on their way to school in Silwan, noting that a teacher was arrested last year for trying to prevent soldiers from arresting a student. 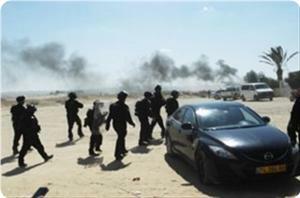 Israeli police forces stormed the village of Beir Hadaj in the Negev to serve demolition notices on Tuesday and were confronted by inhabitants protesting the step. 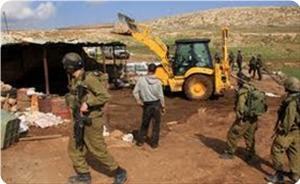 Palestinian sources said that the demolition notices distributed to a number of houses at the pretext of building without permit triggered the confrontations. They said that the inhabitants threw stones at the policemen and set tires on fire while the policemen fired rubber bullets, teargas and stun grenades at the protestors and arrested three of them. Israeli occupation forces (IOF) in armored vehicles stormed the city of Nablus on Wednesday morning and roamed a number of suburbs especially in the eastern areas. 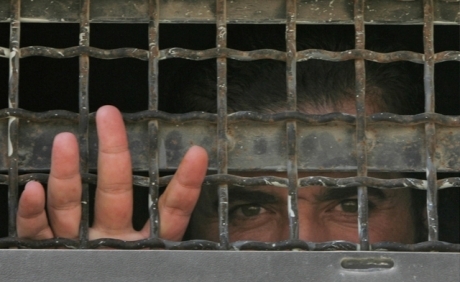 Local sources said that the Israeli forces withdrew from the city without making any arrests, noting that the operation followed three days of confrontations at Hawara roadblock, north of the city, where young men rally in support of Palestinian prisoners in Israeli jails. They recalled that many civilians were treated for gas suffocation on Tuesday while one young man was hit with a teargas canister on his head and taken for interrogation at Hawara army camp along with three others. Israeli warplanes on Tuesday night overflew intensively the densely-populated Gaza Strip causing panic among the civilians. Local sources reported that some F-16 jet fighters flew at high altitudes over Gaza late on Tuesday night, causing loud sonic booms. 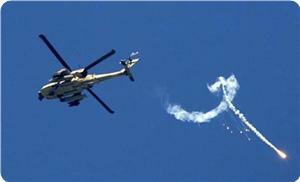 These Israeli overflights took place after Israeli sources claimed that a grad rocket fell in Ashkelon city. However, the Hamas-affiliated government in Gaza categorically denied that any resistance faction had launched any rocket attack on Israeli targets. Civilians in Gaza had expressed fears that these overflights would be the start for a new spate of deadly aerial raids on their populated areas. Apart from the claims about the rocket attack on Ashkelon, Israel has violated several times its truce agreement with the Palestinian factions in Gaza, killing four Gazans and wounded about 80 others in gunfire incidents since an Egypt-brokered armistice took effect on November 21, 2011. A Palestinian child, aged 13, sustained serious wounds during violent clashes on Monday between Palestinian young men and Israeli soldiers near Bilal Bin Rabah Mosque in Bethlehem city. According to local sources, the child, Mohamed Al-Kurdi, was admitted to the operating room in Beit Jala hospital after he sustained life-threatening injuries in his back, liver and one of his feet. They said the boy was shot with two live bullets from a silenced gun. Another young man was also shot with live ammunition and suffered an injury described as bad in one of his feet during the clashes. During the events, the young men hurled stones at the soldiers and torched a military tower near the entrance to Aida refugee camp. Al-Khalil city also saw similar clashes in Bab Al-Zawiya and at the entrance to Al-Arroub refugee camp, while sporadic confrontations took place at the entrance of Beit Ainun that leads to Sa'eir town, the birthplace of slain prisoner Arafat Jaradat, whose death at the hands of Israeli interrogators a few days ago triggered widespread angry reactions in the occupied Palestinian lands. Five young men were wounded with rubber bullets fired by Israeli occupation forces at the entrance to Shufat refugee camp on Monday night. Palestinian medical relief society said that the five young men were hit in their torso, abdomen, and back while dozens were treated for breathing difficulty after the IOF soldiers used rubber bullets, stun grenades, and teargas to disperse the youths. Local sources said that young men from the refugee camp closed its entrance using tires and rocks and threw stones and empty bottles at the soldiers who fired indiscriminately at the young men. Israeli occupation forces nabbed eight Jerusalemites in the Old City of occupied Jerusalem in the wake of violent confrontations near the Aqsa mosque on Monday. Jerusalemite sources and eyewitnesses said that the soldiers quelled Palestinian youths who were protesting Jewish settlers’ provocations during a tour within the Aqsa mosque. They said that the soldiers assaulted the Jerusalemite youths using batons and tasers before arresting eight of them, adding that the soldiers blocked entry of young men into the holy site.